Maybe I'll need to rethink that a bit. What if instead of backing up my most precious VMs to a VMFS datastore on my ESXi 6.0 Update 1 host SuperServer, I instead initiate those scheduled backups from an affordable Western Digital NAS? That way, the NAS does all the compute and storage work. What if that combination is significantly faster than the traditional NAKIVO VMware vSphere appliance, the one that I tested a few months back? With the arrival of NAKIVO Backup & Replication v5.8 today, that's the promise, installation right on the NAS. An alternative, simplified approach to daily de-duplicated backups in a small business environment, or even in a home lab environment. Note, NAKIVO allows free NFR (Not-For-Resale) Licenses for VMware Pros using back in a non-production environment, with no time-bombs or expiration. · NAKIVO Backup & Replication v5.8 can be installed directly onto Western Digital My Cloud DL series NAS. · While NAKIVO Backup & Replication is already on par with or faster than competition in terms of backup performance, we are seeing up to 1.6X performance boost when our product is deployed directly on a Western Digital NAS. This is because backup data is written directly to NAS disks, bypassing file protocols such as NFS and CIFS. 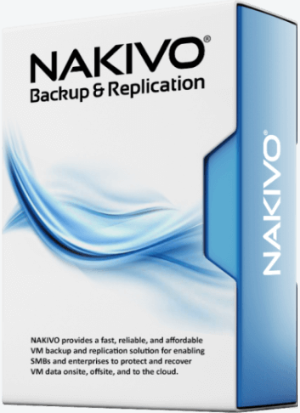 · NAKIVO Backup & Replication v5.8 can be deployed even on entry-level NAS devices, as the product requires just 2 CPU cores and 1 GB of RAM to be fully operational, and still deliver high backup speeds. For example, the Western Digital DL 2100 NAS with 12 TBs of storage has a list price of less than $850 which is enough for the data backup needs of a typical VMware Essentials environment. All-in-one VM data protection – a VM backup appliance combines backup software, data deduplication, and backup hardware in a single solution that is affordable (5X vs. competition), fast (over 1 Gbps backup), reliable (Western Digital + NAKIVO), and easy to manage. Offsite/secondary backup storage – The 3-2-1 backup best practice suggests having 3 copies of data on 2 different media, 1 of which is stored offsite. However, most SMBs either have just one office or have virtual infrastructure only in headquarters. A VM backup appliance can be easily installed anywhere, even if there is no virtual or server infrastructure. Easy disaster recovery – In case of a disaster, the VM backup appliance can be moved to a new office and used to recover the entire virtual infrastructure. Resource optimization - When a VM backup solution is deployed in a virtual infrastructure, it takes away some of the infrastructure resources (CPU, RAM, network). Being an all-in-one solution, a VM backup appliance uses its own processing capabilities and thus frees up resources for other business needs. Less VMs to manage – instead of deploying and managing a VM dedicated for data protection, the customer can use an all-in-one VM backup appliance. Only some hands-on time and testing will tell if these claims are obtainable in my home lab. For me, also of interest would be site-to-site replication of daily backups, sending only the daily (relatively small) incremental changes over the wire. My apologies for the mixed content warnings your browser may give you, because the Amazon items aren't yet fully https-ready, for modern encrypted sites like https://tinkertry.com. If you don't see the Western Digital NASs listed right here below, please consider whitelisting tinkertry in your ad blocker. The 2 bay model has the Intel Atom C2350 dual-core processor with TDP of just 6 watts, the 4 bay has the Intel Atom C2338 dual-core coming in at 7 watts. NAKIVO has historically been a 64 bit Ubuntu Linux appliance, or a Windows installer. I'm assuming on a NAS, it's just an installed Linux instead of a preconfigured appliance Linux. Either way, NAKIVO's taking a completely different approach from the Windows-based backup repository than Veeam's more enterprised-focused products use. It should also be fun to compare/contrast with whatever happens in the upcoming Veeam Availability Suite v9, coming soon. Doesn't matter much what NAKIVO is installed on from a user perspective, since the only UI you use after the install is web-based. I look forward to seeing how hands-on tests play out, whether in a VM or on a NAS, whether at TinkerTry or elsewhere. It's just good to see more options! This was developed using the VMware VDDK (Virtual Disk Development Kit). VDDK requires an Intel/AMD/x86-64 CPU type. This article was produced entirely on a TinkerTry SuperServer Workstation. Full Disclosure: "TinkerTry.com, LLC" is registered as a NAKIVO Bronze Partner, mostly to help get notified of latest news and code releases. I get no special early-access, anybody can sign up for the betas. All TinkerTry site advertising goes through middle-man BuySellAds, and NAKIVO has sometimes run advertisements at TinkerTry. NAKIVO does know if you found their affiliate link from my site, which means the possibility of reseller commissions if you eventually upgrade to one of their paid offerings. Here's their pricing.